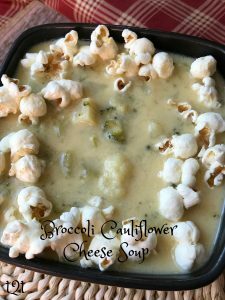 Broccoli Cauliflower Cheese Soup is super delicious and super delicious to make. Winter and soup just seem to go together in my book. I could eat soup everyday and sometimes do during the long winter months here in Wisconsin. 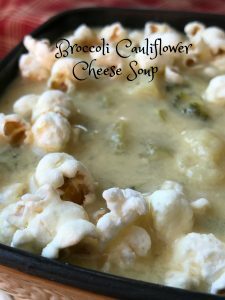 This soup is made with convenient products such as frozen broccoli and cauliflower making it a breeze to make. 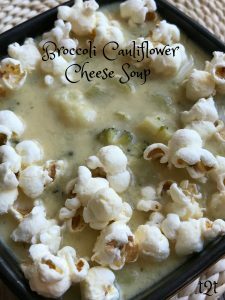 Broccoli Cauliflower Cheese Soup is also made with 2 cans of cream of chicken soup but if you want to make a totally “meat’ free version, substitute 2 cans of cream of broccoli soup instead of the cream of chicken. Now on to the “cheese” part of this recipe. 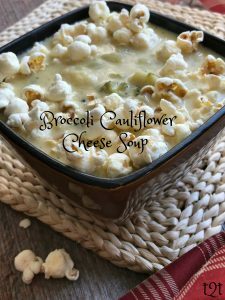 This recipe calls for *gulp* Velveeta cheese…I know your probably thinking,” Why would someone who lives in America’s Dairyland use Velveeta cheese?” Simple really, I love Velveeta cheese, always have, always will. In some recipes, this recipe for example, Velveeta cheese works wonderful because it melts beautifully when heated and Velveeta can be reheated over and over. (essential in soup) Some cheeses will become greasy-like and will separate when heated. Often times cheese will become clumpy, for lack of a better word, and no one wants clumps of gooey cheese in their soup. 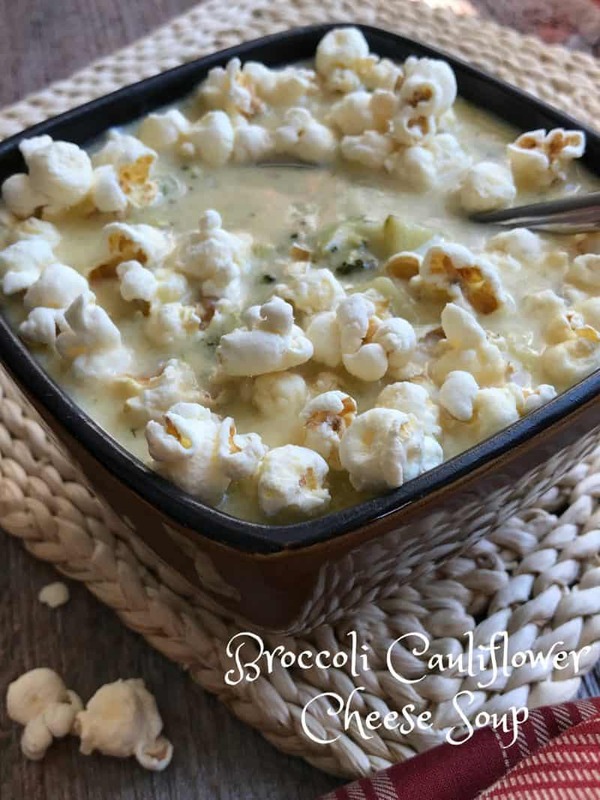 Serve this delicious soup topped with white cheddar cheese popcorn for a fun and tasty treat. In a soup kettle or Dutch oven, combine the first five ingredients; cook over medium heat for for about 20 minutes or until vegetables are tender. Add broccoli and cauliflower; cook over medium heat for 10 minutes. Stir in soup, cheese, thyme and pepper, simmer for 20 minutes stirring occasionally until heated through and cheese has melted. This delicious soup is ready in under an hour. To make this soup meatless, substitute 2 cans of cream of broccoli soup for the cream of chicken soup.